A few weeks ago, John Morgan wrote a guest blog here (November 4, 2014) called “The Catch-22 of Energy Storage and EROI.” My conversation with him started by way of a Twitter discussion of David MacKay’s paper on the long term storage requirements for any energy transition from fossil fuels to solar-based, more intermittent, sustainable sources such as wind and solar. The posting was heavily based on a recent paper written by a set of scientists, listed with D. Weißbach as the first author (Energy 52 (2013) 210). Because of the importance of the issues that Dr. Morgan raised, I promised to comment on the Weißbach paper directly in this blog. The economic efficiency and wealth of a society strongly depend on the best choice of energy supply techniques which involves many parameters of quite different significance. The “energy returned on invested”, EROI (often also called ERoEI), is the most important parameter as it describes the overall life-cycle efficiency of a power supply technique, independent from temporary economical fluctuations or politically motivated influence distorting the perception of the real proportions. The EROI answers the simple question “How much useful energy do we obtain for a certain effort to make this energy available” (the terms “effort”, “useful”, and available will be specified below). In last week’s blog I quoted the Weißbach paper as to the origin of the economic threshold to show that it has nothing to do with physics but is instead based on economic criteria. The paragraph below describes the origin of their data. They came from LCA analysis, and as the article mentions, they are controversial. In this work, based on several LCA (life cycle assessments) studies, EROIs will be calculated by using a strictly consistent physical definition thus making the energy producing techniques comparable to each other. Energy input with the highest quality difference, i.e. thermal energy and electricity, are listed separately (given in percentage electrical of the total energy input), so the factor of interest, either the EROI or the EMROI can easily be determined and compared. Great dependence on the particular set of technologies that are in use. The two main inventories that are included in most analyses are energy and water. Both inventories suffer from the same broad range of values as measured in different facilities. I just recently returned from a conference in Iceland in which I presented our work on water stress (“The Many Faces of Water Use” by Gurasees Chawla and Micha Tomkiewicz; 6th International Conference on Climate Change, Reykjavik, Iceland (2014)). One of the issues that we discussed there was the concept of virtual water: the “sum of the water footprints of the process steps taken to produce the product” – an idea that constitutes part of the LCA analysis of products. For instance, the typical virtual water of fruits is 1,000 m3/ton. To remind us all, the weight of pure water in these units is 1ton/1m3, so the weight of the virtual water is 1,000 times the weight of the product itself. Where did the extra water go? For the most part, it either became waste water or evaporated. Yes they are blaming the US for the depletion of Mexican water but in fact they should blame themselves because they are subsiding the Mexican strawberries growers by not charging them anything for the water that they use so that they will be able to better compete against the American growers. Here’s one example of the concept of virtual water, as given in an article in a Mexican science magazine: when the US imports strawberries from Mexico, the imported strawberries conceptually “carry” with them all the virtual fresh water that is so greatly needed in both countries (Camps, Salvador Penische and Patricia Ávila García, Revista Mexicana de Ciencias 3:1579 (2012)); this equates to the US “stealing” water from the Mexicans. As a result, some are blaming the US for the depletion of Mexican water, and charging our country with immoral economic capitalism. Meanwhile when proper water management is being used (mainly waste water treatment), the virtual water can be reduced by 90%. Power systems provide exergy (electricity), but they must do it when this exergy is required, the second quality factor of usability. For the energy output, although the term “available” is easy to implement by defining the connection point to the network (as done here) or to the consumer, the term “usable” is more complicated. It implies that the consumer has an actual need for the energy at the moment it is available. It also means the opposite, that energy is available when the consumer needs it. There are only three possibilities to make the energy output fit the demand. Ignoring output peaks and installing multiple times of the necessary capacity as a backup to overcome weak output periods. Installing storage capacities to store the peaks, with reduced over-capacity plant installations (short: buffering). Adapting the demand to the output at all times. The third point is obviously not acceptable, because one becomes dependent on random natural events (wind and PV solar energy). A developed and wealthy economy needs predictably produced energy every time, especially the industry needs a reliable base-load-ready output to produce high quality goods economically. So only the first two points are acceptable, whereof the second one is the economically most promising. 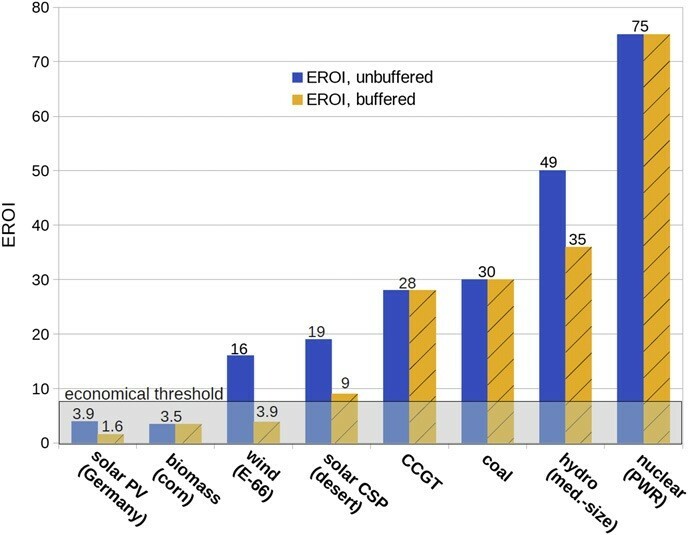 Some energy generation techniques need more buffering (wind energy, photovoltaics), some less (solar CSP (concentrating solar power) in deserts, hydro power) and the fuel based ones almost no buffering (the fuel is already the storage). Technologically, this can only be solved by storage systems and over-capacities which are therefore inside the system borders, “replacing” the flexible usage of mined fuel by fuel-based techniques. In opposite to that, the IEA (International Energy Agency) advises to consider the backup outside the system borders without any scientific justification . There is no argument that synchronization of electricity supply and demand is required – and not only with use of intermittent, sustainable sources such as wind and solar. Synchronization is also is required now to adjust for the peak and trough in use, but it is considerably smaller than the need with intermittent resources. However, the use of batteries is not the only option. Similar to proper water management, movement of electrical power from places of excess capacity to places of excess need by the use of smart grids, is an important option. In addition, many places combine different forms of energy, with different variability, to adjust for the intermittency of the sources. There is no question that these options reduce the EROI as well. By how much – I have no idea. Similarly to the water management case, it will depend critically on the boundaries set in the modeling. This posting is getting to be too long. I will finish off with two short comments on the actual EROI calculations and expand in the next blog on the biomass calculations that demonstrate the close correlation between the science and politics. We obviously cannot cover the planet with enough CIGS (Copper Indium Gallium Selenide) or CdTe to satisfy our energy needs, but they can and will be part of the spectrum of technologies that we use to replace fossil fuels. Si based cells are currently the overwhelming majority of active devices but once we are raising “in principle” arguments to stop development of alternative energy sources, we’d better be as inclusive as possible. Looking at the figure above, the only two viable alternatives to fossil fuels are nuclear and hydro. The number of hydroelectric sites available is quickly diminishing, however, which leaves us with nuclear energy. Germany recently reacted to the 2011 Fukushima nuclear plant’s meltdown by completely discontinuing development of nuclear power, and it is far from the first time people have expressed fear of the energy source’s possible repercussions. So nuclear power might have other issues beside EROI. As seen from the graph above, the Weißbach paper lists nuclear power as having the highest value of EROI. The scientific community is full of literature arguing other opinions. A paper in Scientific American that summarizes EROI literature data (Mason Inman. April 2013) illustrates the discrepancy regarding nuclear energy – from values smaller than 1 (not an energy source) to the cited EROI to be between 40-60 for centrifuge-enriched uranium. Wikipedia, in its piece about EROI, gives the value for nuclear energy to be 10 for a diffusion-enriched plant (reference not provided). All of this provides enough information to show us more research is needed on the EROI of future energy sources. What it certainly does not do is guarantee with full security that we can currently predict the unique energy mix that will be necessary to displace or replace the use of fossil fuels. This entry was posted in Climate Change and tagged Adaptation, Clean Energy, Climate Change, Economics, Electricity, Emissions, Energy, Energy Storage, Environment, EROI, Fossil Fuels, Fukushima, Germany, Hydroelectric, Iceland, John Morgan, LCA, Mitigation, Nuclear, Nuclear Energy, photovoltaics, Physics, Power, Science, Solar, Solar Energy, Sustainability, Technology, United States, US, virtual water, Weißbach, Wind. Bookmark the permalink. We all want solar power to be effective and economical at producing electricity. I bet a lot of people would find this controversial but shouldn’t we be finding a way to make the product of photosynthesis our electricity? So we won’t use electricity at any more. At least we would have an endless supply of energy. What do you think?